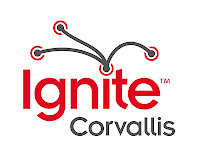 Yes, you read correctly; The Ignite Corvallis 2 proposal deadline is extended to this Sunday, October 18th at Midnight. The selection committee is unable to meet to select the lineup until Monday the 19th so we have extended a submission reprieve to the masses. You can also edit existing proposals up to Sunday night as well. If you have a proposal submitted we will notify you on Monday evening if you are "in". However, even with the submission extension, you *may* want to start working through your presentation this weekend just in case you are selected. More Ignite Corvallis 2 Tickets Available! Ignite Corvallis 2 Tickets Available! Ignite Corvallis 2 Lineup Selected!